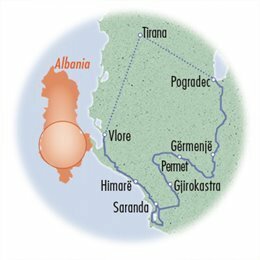 Most people don’t know very much about Albania, yet it borders Greece and is across the Adriatic Sea from Italy. It was isolated from much of the rest of the world during a 50-year communist dictatorship that reigned until 1991. With a population of only 3 million people and a fledgling tourist industry, today’s democratic Albania has an unspoiled landscape full of mountains and coastline, roads devoid of traffic, and a temperate climate full of sunshine and balmy temperatures. 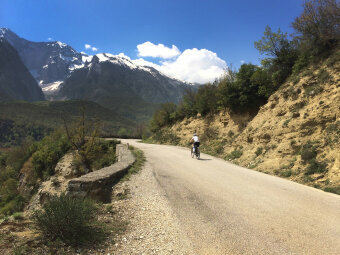 It is Europe’s last frontier and a cyclist’s haven. Large rolling hills with some longer climbs. Moderate to Advanced cycling level. 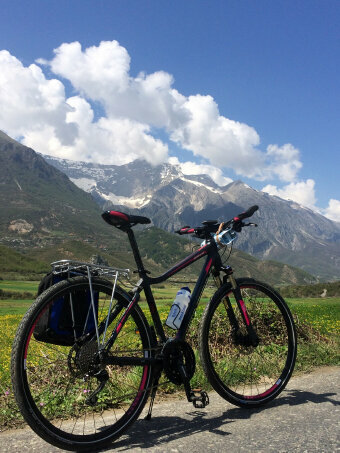 Leisurely level with an e-bike. 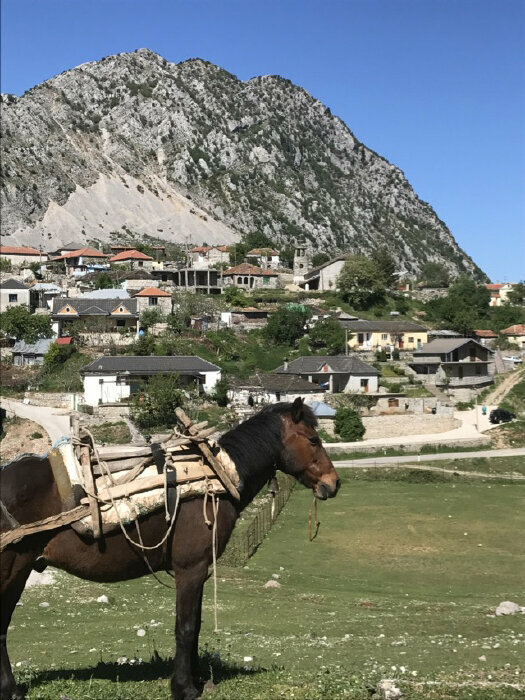 8 nights lodging, 8 breakfasts, 7 lunches, 7 dinners, walking tour of Gjirokastra, entrance fee to ruins, airport transfers, van support, hybrid bicycle, and trained bilingual guides. Giant Rove hybrid bike is included in the cost of the tour. Electric-assist ebike is $195. Fly round-trip to Tirana, Albania. There are no direct flights from the USA but there are many flights from other European cities and Istanbul. Arrive anytime on the first day of the tour. At the end of the tour, we will shuttle back to Tirana, arriving at the airport by noon. "It was an experience of a lifetime. I felt like I saw the country from a unique vantage point, and I was also physically challenged." 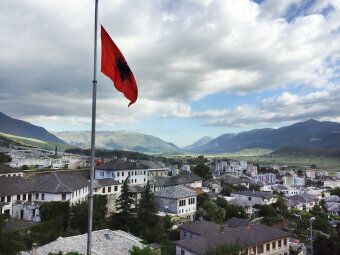 "Everyone should go to Albania! 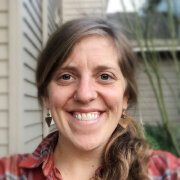 Wait 10 years and it will be too late for the laid-back simple beauty and ease of biking." DAY 1: We’ll meet in Albania’s capital of Tirana. It’s probably the only capital city in Europe that does not have a real McDonald’s. If you arrive early, take some time to explore this old city. Visit the cultural center of Skanderbeg Square, the colorful central market for organic fruits and vegetables, and the Tirana Mosaic, the only visible Roman ruins in the town. 0 miles. 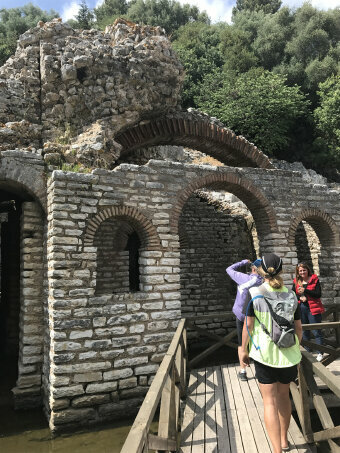 DAY 2: After breakfast we’ll shuttle out of the busy city and unload the bicycles at the point we first glimpse the UNESCO World Heritage site of Lake Ohrid. 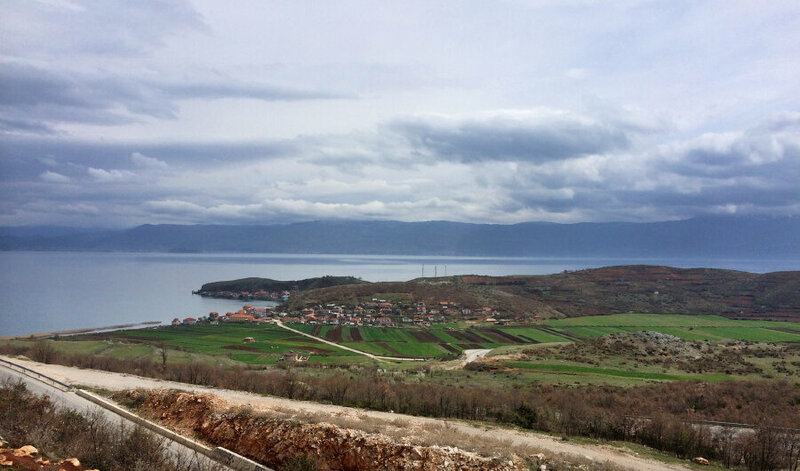 We’ll cycle down to the lake and along its shores to our hotel in Pogradec, stopping along the way for lunch at a waterfront restaurant. 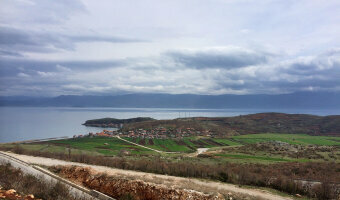 You can choose to relax at our hotel or continue on to cross the border into Macedonia to the Monastery of St. Naum. The monastery was established in 905 and the saint is buried here. Peacocks now watch over the beautiful and peaceful building. 24 miles. DAY 3: Today’s bike ride begins with a short warm-up on the Korce plateau surrounded by farmland. 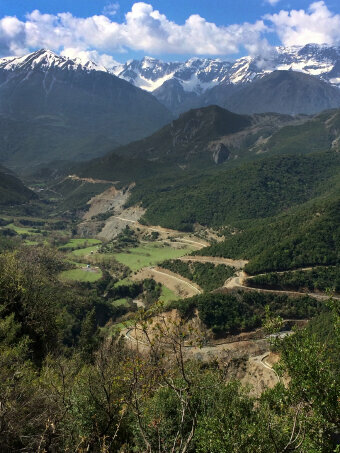 Then we’ll begin a climb into the arid Border Mountains as we skirt the boundary with Greece. 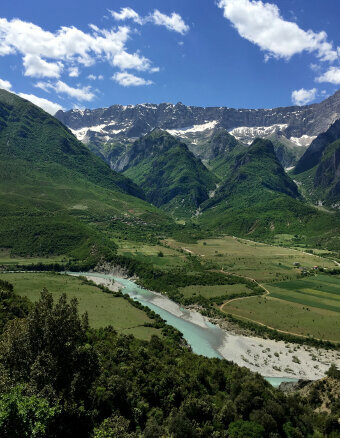 We’ll cycle over Barmash Pass and then down into the fertile valley of Germenj. We’ll overnight in small cabins at a family-run trout farm. You can help the small children practice their English, walk among the fish pools naturally filled by nearby springs, or enjoy a glass of homemade wine while you await your well-earned dinner tonight. 45 miles. 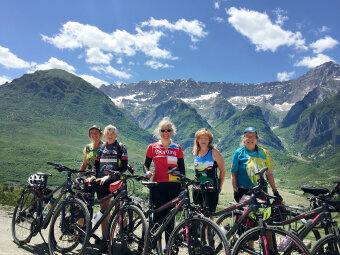 DAY 4: After a hearty farm breakfast, we’ll continue our cycling on a plateau where we’ll pass haystacks standing 10’ tall. We’ll see snow-capped mountains in the distance as we descend through a spectacular gorge made by the River Vjosa. We’ll stop in the sleepy town of Leskovik and fill our water bottles with a spring that looks as if it comes out from the center of a tree. After lunch, it’s a short ride to the Benja hot springs. 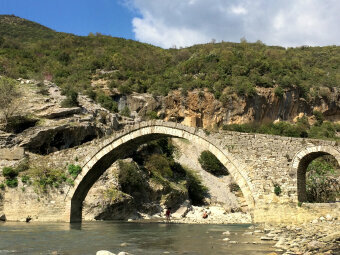 They mix with the cool water from the river and make a lovely soaking place as you admire the nearby Roman stone bridge built in the 14th century. We stay at another farmhouse tonight. After our homegrown and home-cooked dinner, you can taste the homemade raki, the local aperitif. 33 miles. DAY 5: After another hearty farm breakfast, we’ll continue cycling through the narrow valley and then into the gorge made by the Drino River. We will follow it until it opens out into a beautiful wide plain. After lunch at a café built over the Tepelene Waterfalls, we’ll shuttle a short distance to the UNESCO World Heritage site of Gjirokastra. 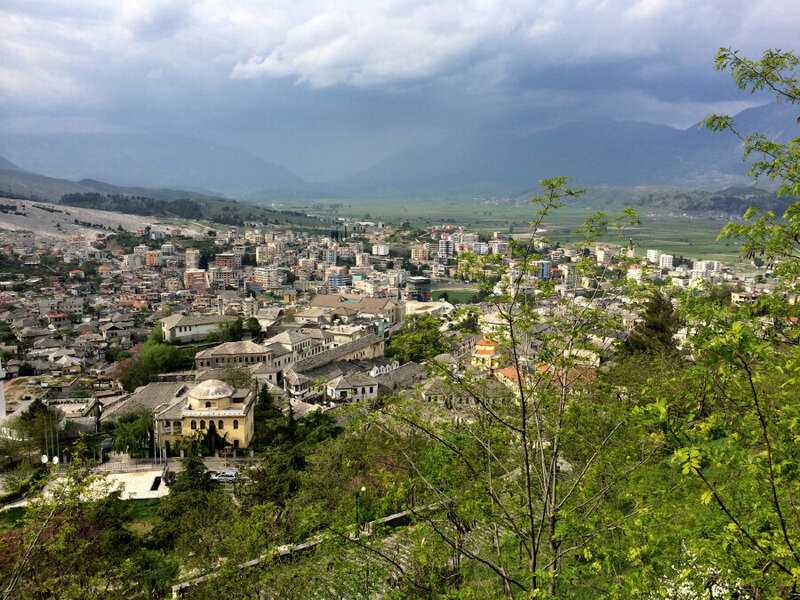 Called the “City of 1000 Stones”, the town of Gjirokastra dates back to the 3rd century. Most of its current buildings date back to the 18th century and hug the steep mountainside. We’ll take a guided walking tour and visit the citadel that overlooks this pretty Ottoman town. 29 miles. DAY 6: We start our day with a short shuttle and unload the bikes at the top of Muzina Pass. Then we cycle downhill through a gorgeous landscape striped with orange cliffs and silvery-green olive trees. 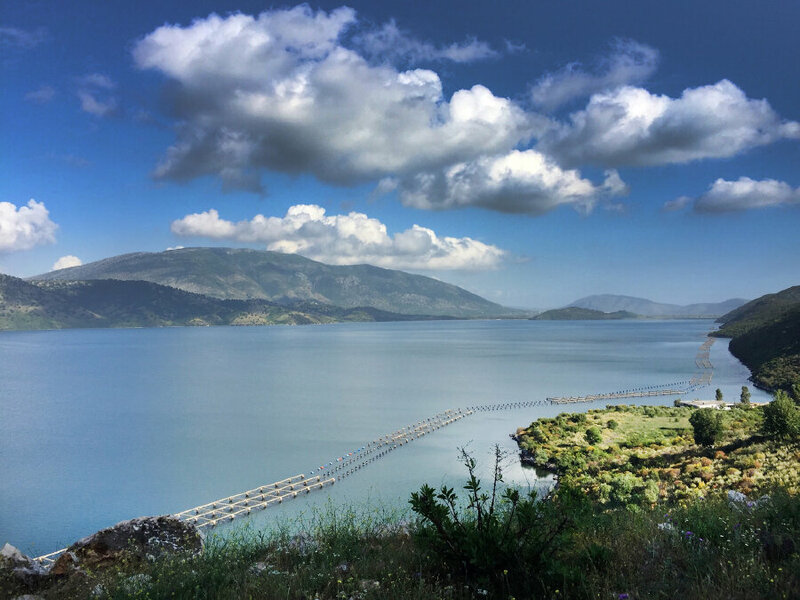 We’ll catch our first glimpse of the sea and then take a very short ferry ride to the UNESCO World Heritage site of Butrint. 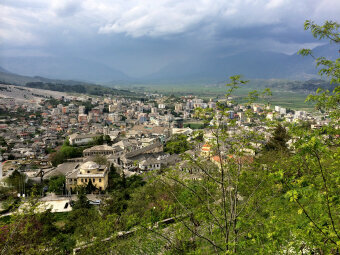 It is one of Albania’s most important archeological sites, dating back 2500 years. 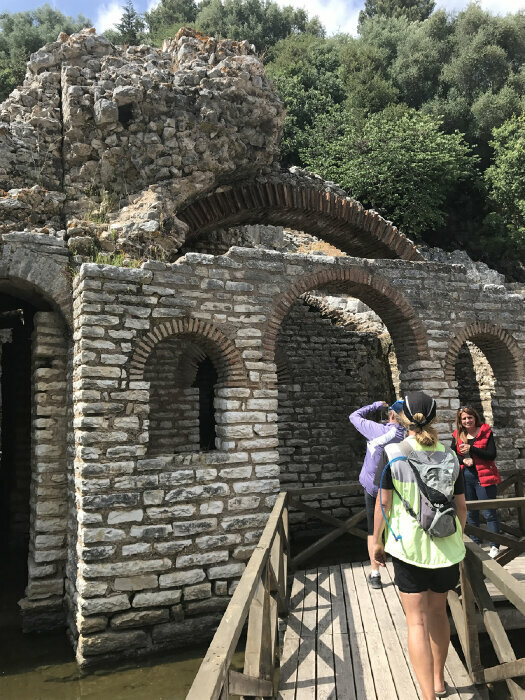 Even if you don't care for ruins, you’ll enjoy the peaceful walk among the ancient rock structures constantly being threatened with the overgrowth of wild vegetation. From there, we’ll finish our ride to the seaside town of Saranda. The Greek island of Corfu will watch over us as we ride along the coast to our hotel. We can choose to watch from our balconies as Albanians promenade along the water-front before dinner, or we can join them, stopping for a gelato along the way. Dinner is on your own tonight. 44 miles. 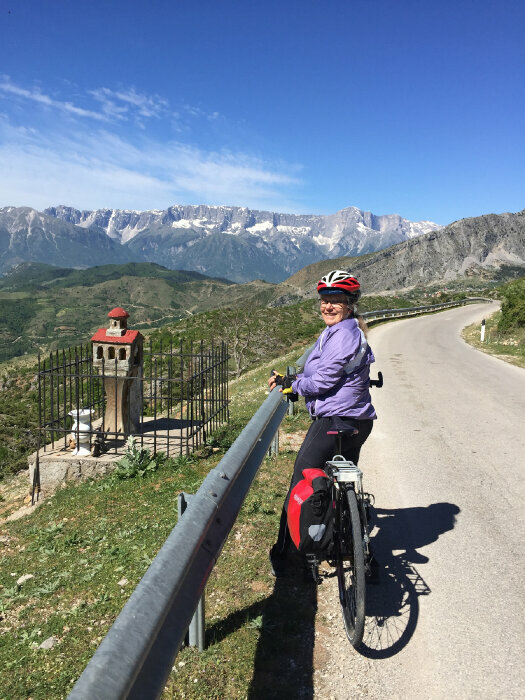 DAY 7: We have a roller coaster kind of ride today as we climb and descend paralleling the coast. The sea will always be to our left as mountains loom high to our right. After lunch in the small fishing village of Qeparo, we’ll continue up the coast by Palermo Bay, a communist era submarine base. 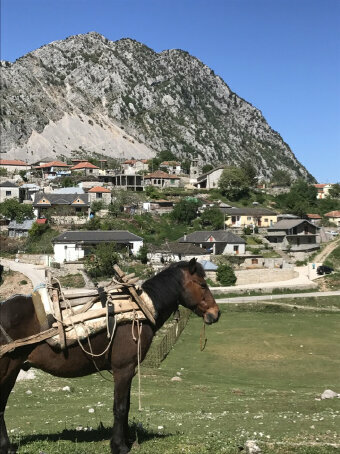 You can’t help but be struck by the many signs of growth in Albania, especially along the coast. The area is dotted with half-finished skeletons of buildings as the owners save up money to finish them. 34 miles. DAY 8: Our last bike ride may be the most beautiful. We start from sea level to climb up Llogara Pass at 3422’. It’s a challenge, but you can easily choose to skip it with a ride in our support van. You can wait for the others near the top where the view over the Ionian Sea is spellbinding. We’ll have lunch at a restaurant in Llogara National Park, and then it’s a beautiful descent through the forest back down to the coast. You can reward yourself with a dip in the ocean or just a relaxing recline overlooking the sea at our hotel near the resort town of Vlora. We’ll celebrate our accomplishments at our last dinner together tonight. 40 miles. DAY 9: We’ll head to the Tirana airport after breakfast today, arriving by noon. From there, we’ll say our good-byes and you can catch your flight home. 0 miles.